Alan Schlesinger grew up in Venice, California, and came to Memphis 18 years ago. Schlesinger got into the food business during college; he left school to join the McDonald’s Corporation. He rose from assistant store manager to an area supervisor in seven years and then three years later was a store operations specialist at the Operations Department of McDonald’s World Headquarters. Schlesinger’s expertise in food preparation on grills is a key to the superior product served at Humdingers. Alan had been with McDonald’s 43 years before leaving in 2009 to become a partner with Chris Smith in Robust Ventures and its Humdingers Restaurant concept. 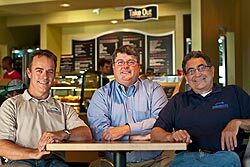 Chris began his restaurant career with TPI Restaurants (the local franchisee for Captain D’s) first as an Associate Manager then an Executive Manager. He left for the health care industry and he has been the Administrator/CEO for The MidSouth Cancer Center, P.C. since 2004. Even though Chris had not worked in a restaurant setting since the nineties, he was searching for just the right concept to jump back in. In 2009, he joined with Alan Schlesinger and created Robust Ventures, and together they found the unique concept they were looking for – Humdingers Restaurant. Humdingers is the original concept of experienced restaurateur Michael Devilliers, a native of South Africa with experience at the world renowned Sun International casino, hotel and resort organization. Devilliers has created and opened restaurant concepts and franchise organizations in the United Kingdom, Italy, South Africa, Los Angeles, Saudi Arabia and Atlanta. Michael brought his vast knowledge to Memphis in 2009, when he joined forces with Robust Ventures to begin the Humdingers concept.